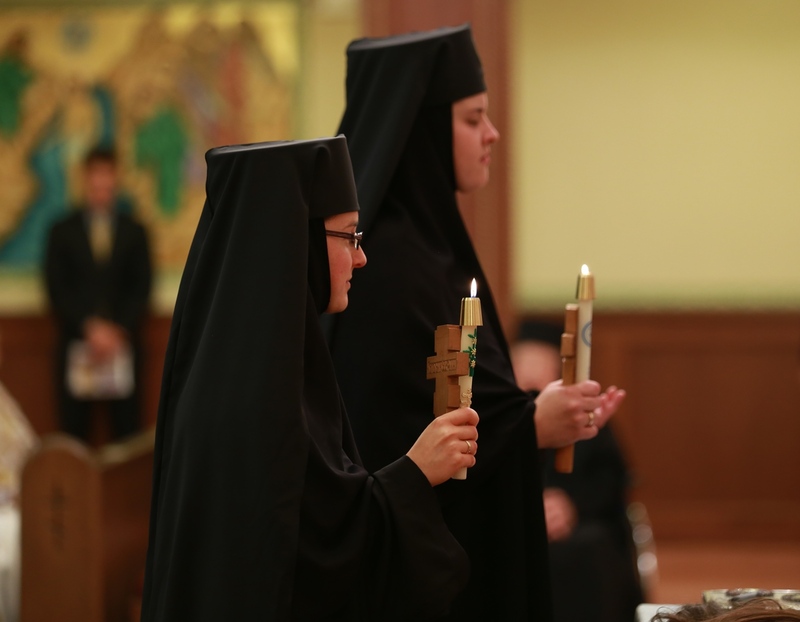 Teen girls: you're invited to a sleepover at the monastery, Jan. 16-17! Teen girls 13-18 are invited for an evening of prayer, food and fun, at the monastery for our girls' sleepover, January 16-17. Click here for the schedule and to register! Families of the girls are invited to Divine Liturgy and brunch on Sunday morning. Space is limited to 15 girls, so sign up soon! I have been reflecting the last several weeks on my call to spiritual motherhood, which made itself profoundly manifest at my profession. 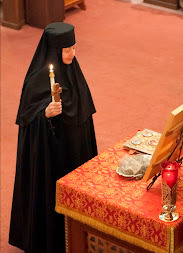 The weeks following the profession have been a time of learning from Jesus, through the example of the Mother of God, what it means to be a spiritual mother. In my search to learn more about Mary’s maternity, I was led to pick up a book called The Reed of God by Caryll Houselander, which has been teaching me much about Mary’s example of motherhood. 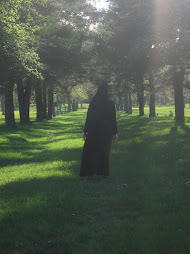 I was pondering Mary’s pregnancy and how we are all called, nuns in particular, to be pregnant with God. We are called to bear Christ to the world, not through extraordinary means, but through the ordinariness of everyday life. “Yes, it certainly seemed that God wanted to give the world the impression that it is ordinary for Him to be born of a human creature. Not much has changed outwardly in my daily life since my life profession. I still have the same work to do, I still have the same sisters to love, I still must respond ‘yes’ every day to all the calls that Jesus makes. What is different is that I now interiorly have the grace to fulfill my vows to Him, if I just turn to Jesus in every ordinary situation and allow Him to unite Himself to me through the very mundaneness of everyday life. I must surrender in each situation to His will and allow Him to love through me each person I encounter – filled with Him within me and bearing Him, not myself, forth to the world. “The surrender that is asked of us includes complete and absolute trust; it must be like Our Lady’s surrender, without condition and without reservation. We shall not be asked to do more than the Mother of God; we shall not be asked to become extraordinary or set apart or to make a hard and fast rule of life or to compile a manual of mortification or heroic resolutions; we shall not be asked to cultivate our souls life rare hothouse flowers; we shall not, most of us, even be allowed to do that. What we shall be asked to give is our flesh and blood, our daily life – our thoughts, our service to one another, our affections and loves, our words, our intellect, our waking, working, and sleeping, our ordinary human joys and sorrows – to God. So here is my challenge to you in the final days of the Nativity Fast or Advent: Remember… that it is more important to come bearing Christ rather than gifts to all the festivities you will be attending… that you should share the joy of a life lived in union with Christ along with your Christmas cookies… that you should love each person you encounter in these final days of preparation, from the UPS delivery man bringing your last minute Amazon purchases, to your kids who may do more to hinder your holiday decorating than help. Each of these moments is an opportunity to incarnate Christ, to experience the true meaning of Christmas and to receive the promise of God’s love as Mary did, in the very normalness of life. 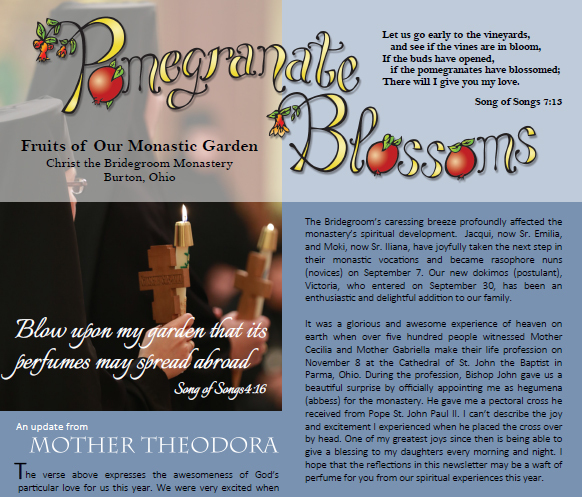 A new design, twice as many pages, and a beautiful reflection from each one of the six members of our monastery about our new steps in monastic life this year. 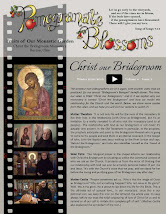 Please enjoy our Winter 2015/2016 edition of Pomegranate Blossoms! Congratulations Mother Cecilia & Mother Gabriella! 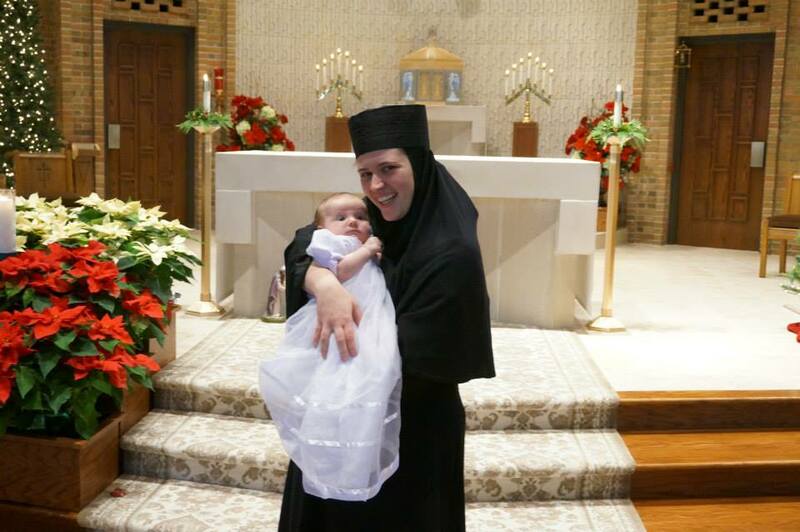 It's been quite busy here at the monastery this past month, so we are finally getting around to a short post to congratulate our new mothers, Mother Cecilia and Mother Gabriella, who made their life profession and were tonsured as stavrophore ("cross-bearer") nuns on November 8, at the Cathedral of St. John the Baptist in Parma, Ohio. About 500 people joined us to witness this profound moment. 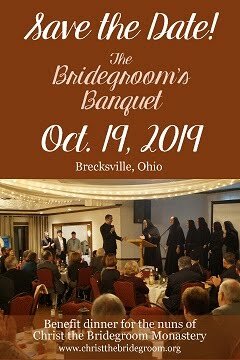 Mother Cecilia and Mother Gabriella are happily getting accustomed to being called "Mother," wearing a wedding ring and a klobuk, and growing deeper in union with their Bridegroom, Christ! We plan to post the beautiful pictures soon! Please keep all of us in your prayers! You are in ours. May God prepare your heart for His coming as we approach the feast of His Nativity.